Carve Tahoe begins next week at Northstar. International teams of ice carvers from Germany, Canada, Finland, Japan, and Mexico will compete with teams from the US. Three-member teams will sculpt from 8:00am-9:00pm each day, January 28-31. Visitors are encouraged to stop by anytime to view the sculpting in progress. The blocks are in the parking lot adjacent to the Village. All teams will sculpt from identical10x10x12 foot compressed snow blocks. Northstar has been making snow for several days at the bottom of the Highlands Gondola to use for the blocks. The blocks are reported to weigh 20 tons. Judging will be held February 1 at 9:00am. Each sculpture will be ranked and a “People’s Choice Award” will be revealed. Volunteer Party: January 24 from 4:00pm -8:00pm. 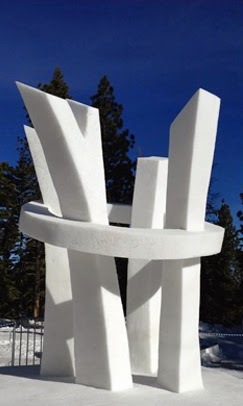 The Carve Tahoe volunteer party will be at Moody's and Bar of America in historic Truckee this Friday night with ice carving demonstrations by Team Tahoe Truckee and Team Canada. Sapporo beer and Finlandia Vodka drink specials will be part of the mix. Proceeds will go to the Humane Society of Tahoe Truckee. Well, it’s really nice to hear about such a wonderful event related to carving. Well, the place is really amazing and the beauty of event will enhance its overall attractiveness multiple times. I really appreciate organizing such a beautiful event.